Switzerland's AMAC Aerospace group is becoming a leading player in VVIP aircraft completion. But the group is about much more than that, as its management was able to highlight at the EBACE show. In just 10 years AMAC has already expanded over 4 countries and 6 locations and its development is showing no signs of slowing down. Access to the entire article is reserved for our subscribers who have subscribed an annual subscription formula, or holders of a wallet (credits). Sign up for our free MRO & Support newsletter ! S7 TECHNICS has become the MRO provider in Russia and the CIS to perform base maintenance checks on the Airbus A320NEO. The aircraft is operated by S7 Airlines and is powered by two Pratt & Whitney's PW1127 engines. The maintenance work was conducted at the company's Moscow Domodedovo airport site and included the 7500 FH / 5000 FC / 24-month 1С-check. AFI KLM E&M has entered into an exclusive maintenance agreement with VIVA AIR GROUP that includes the support of airframe components and logistical services. The implementation of this contract with the low-cost airline based in Colombia and Peru will be provided by BARFIELD, a subsidiary of AFI KLM E&M based in Miami (Florida). DASSAULT AIRCRAFT SERVICES (DAS) has opened its Stuart Service Center at Witham Field Airport (KSUA). With 2,300 m², it is twice the size of the former Florida satellite service centre of the DASSAULT FALCON JET's MRO subsidiary, which was located in West Palm Beach. It will perform 12 to 36 month inspections on Dassault Falcon aircraft, host a GoTeam and offer FBO services. (MRO Americas) PRATT & WHITNEY confirmed that DELTA TECHOPS will be part of the worldwide network of approved GTF maintenance centers (PW110G-JM and PW1500G in its case). The Atlanta center becomes the third approved in the United States, alongside the facilities of the engine manufacturer in Columbus and West Palm Beach. (MRO Americas) SURINAM AIRWAYS has signed an equipment support contract with AFI KLM E&M for its two Boeing 737-700s (which will be extended to the third after its delivery in 2020). 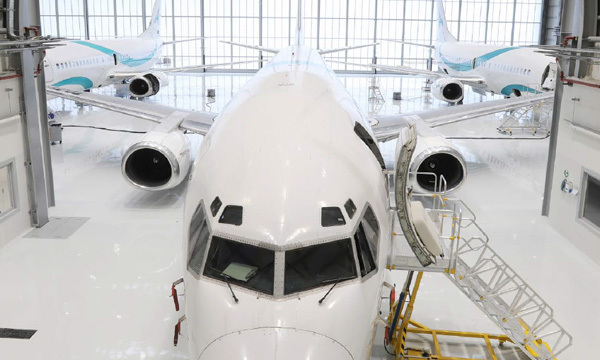 It is part of the Component Services Program (CSP), built by the MRO company and Boeing, and includes repair services, pool access and the supply of a Main Base Kit. ALERTAVIA, the News platform for Aerospace and Defense industry Professionals.